In this paper a novel application of salad leaf disease detection has been developed using a combination of machine learning algorithms and Hyper Spectral sensing. 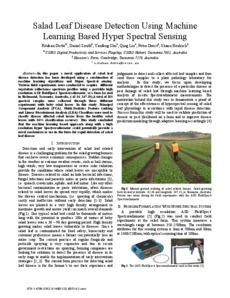 Various field experiments were conducted to acquire different vegetation reflectance spectrum profiles using a portable high resolution ASD FieldSpec4 Spectroradiometer, at a farm located in Richmond, Tasmania, Australia, (-42.36, 147.29), A total of 105 spectral samples were collected through three different experiments with baby salad leaves. In this study, Principal Component Analysis (PCA), Multi-Statistics Feature ranking and Linear Discriminant Analysis (LDA) Classifiers were used to classify disease affected salad leaves from the healthy salad leaves with 84% classification accuracy. This study concluded that the machine learning based approach along with a high resolution hyper Spectroradiometer could potentially provide a novel mechanism to use in the farm for rapid detection of salad leaf disease.